Locals amble or jog along sections of the walk every day and every time they are smiling. The many moods of the ocean is the first and constant reward walkers receive for getting down to this part of the coast, but there is so much more to get involved in, which is what makes it truly world-class. For the best experience, start from the kiosk at Kingston Caravan Park, indulge in a freshly squeezed juice and an all organic breakfast. Sit out in the sunshine and sea breeze with an uninterrupted ocean view and take a pause for thought, as you will actually be sitting right next to a beautiful and significant Aboriginal sacred site. The fire-pit at Kingston Park, the freshwater springs that occur along the walk and the majestic grey heron all feature in the dreaming story that tells of their creation in Aboriginal culture. To really appreciate how it ties into the walk, it is suggested to read the dreaming story before you set off as you are following the footsteps of a god. There are some beautiful sculptures and lookout points at the start of the walk and the scenery remains spectacular as you continue along the trail. The boardwalk is suitable for all fitness levels and makes the walker feel like they are on a fantasy adventure quest, but for the more intrepid explorer, you can head along the coast on the rocks. On warm days, there are many spots for snorkelling and fishing that are not only picturesque but private and easily accessible. The cornucopia of sea life includes the rare leafy seadragon, but even those who aren't tempted to get in the water will often be gifted with the sight of a solitary seal, lifting a flipper to warm it in the sun, giving walkers the appearance of a personal salute. More often than not, there will also be pods of porpoises or dolphins and the well placed information placards will help you identify what you are looking at. The bird life will be a pleasure for professional spotters and casual walkers alike, as the birds equipped to live on the coast are rugged and spectacular. A lone Osprey will hover like a hawk and dive suddenly into the brush, carrying off its prey and leaving the onlooker with a haunting cry. Albatross, pelicans, sea terns and herons all take turns in fishing and taking flight, both delightful actions to watch. 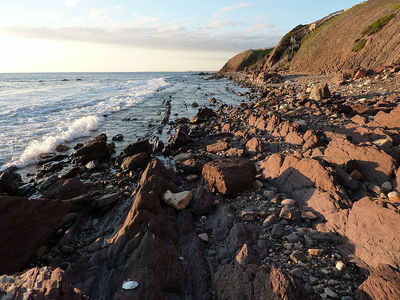 The boardwalk will end in the Hallett Cove Conservation Park where there are magnificent prehistoric rocks formations on either side of the rails. There is ample information to educate yourself and surprise all your friends with your in depth knowledge at the slideshow you will have later at home because regardless of the weather, you will be guaranteed to get your camera out time and time again. Why? The most beautiful and interactive scenery, just 20 minutes out of the city. Thanks for sharing that Delana, I've been here for 4 years and love walking around the hills and beaches but didn't know about this great looking route. Cheers.